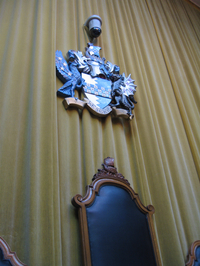 Local democracy returned to its Wandsworth home last night with the full council taking place for the first time in over a year in the council chamber. The chamber had been out of action after the roof partially collapsed. It was then out of action even longer when it was discovered that asbestos seemed to be a key component of pretty much everything in there. But now it’s open for weddings and the occasional council meeting. Sadly the change of venue didn’t really change the meeting that much. While there were plenty of maiden speeches from councillors first elected earlier this year (and some impressive maiden speeches too, I think it’s generally a good intake) the general tone was none too promising and there was a clear theme of deficit denial from the Labour side. I suppose politically I should be pleased. While the Labour party are in denial about the political realities that most people have face up to it means they aren’t being an effective opposition. But that, in turn, is bad for democracy. For me last night combined with a session I’d attending earlier in the day run by Local Goverment Leadership about the impact of the deficit, which is huge. The upward trend of public spending over the last few years of the Labour government is shocking and cannot be explained away by Keynesian theory, only by irresponsible government. 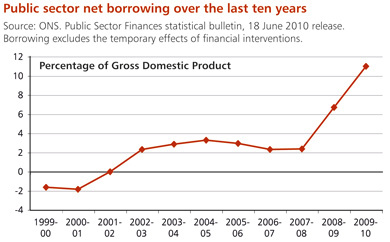 The graph (taken from the Treasury website) starkly illustrates how borrowing got out of control in the last few years of the Labour government. For whatever reason government started borrowing dramatically to cover the shortfall between tax they were raising and what they were spending. This is repeated again and again, I know, but there is no escaping the fact that action is desperately needed to address the deficit. Denying the deficit will not, sadly, make it go away. For information, the “whatever reason” is the so called financial crisis… maybe you heard about it?